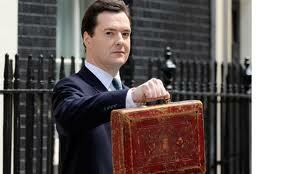 His original name was George Gideon Oliver Osborne but at the age of thirteen years he dropped the name Gideon. He wanted to be considered normal like his other chums at his expensive London private school. It clearly failed because Osborne more than any other Cabinet minister looks like the man ready to pull the switch on the gas oven. He has a vampire smirk that suggests his dark desires will prevail or as Ann Widdicombe once famously said about Michael Howard, ‘There is something about the night about him.’ There have even been rumours about Osborne salivating over cocaine lines with eccentric ladies giggling sweet Gideons in his ear. But at least he tried. Some have alleged that the name change was done deliberately to help his career in politics. Something helped him switch jobs from stacking shelves in Sainsburys to discussing policy in Conservative Central Office. This happened very quickly; think about Robert Johnson at the crossroads where he became a guitar genius. The fans of Robert Johnson believe the bluesman sold his soul to the devil. Most Tories become blank eyed when you mention the devil but a few wonder if perhaps Satan really did put a hand on the shoulder of one of his favourite vampires. For many on the left, Osborne is the most hateable of those within the present government. Cameron is more of an empty headed performer than a vicious architect. We may not like his friends but Cameron is at least nice to his own. George Oliver is an almost unique mix of social advantage and sycophancy. His haters think of the photograph of Osborne out in the countryside shooting grouse. Osborne looks like a parvenu, a spare part amidst all the wellingtons and waxed jackets. The effect is odd, even mysterious considering his private education, privilege and wealth. Osborne likes to pretend his family was a typical hard working family of wallpaper manufacturers. This may explain some of the stickiness but the wealth of the family has benefited much from their membership of the British aristocracy. Inevitably, his education was ultra expensive but in the case of our economic tiller the return was poor. Osborne graduated from Oxford with a 2-1 in Modern History. This can be roughly trranslated as thick posh. So the left not only hate him, he makes them feel superior. But he is not the first Tory averse to intellectual curiosity. He is amongst friends and that helps. One characteristic above all enrages his enemies. George Oliver Osborne appears to care about nothing or no one other than himself. When he inadequately explains his policies and argues incorrectly that high income tax discourages investment (not that 50% on income over £150,000 is high) it becomes clear that he has one ambition and that is to pass money from the poor to the rich. So far his performance as a chancellor has been awful. Economic growth, employment, investment have all deteriorated and Britain’s credit rating has acquired hostile caveats. He persists, though, in arguing that Britain needs more neo-liberalism economics. He claims that he is friendly to business and understands business but his desire to cut the welfare state indicates a man who has failed to grasp the principles of limited liability. This exists to ensure that businessmen do not go bankrupt only their businesses. It is how businessmen and businesswomen are given a second chance. The welfare state is limited liability for the rest of us. It allows us to start again after misfortune. But in case you believed his shameless phrase ‘we are all in it together’ George is not really an equality man. When it comes to limited liability ordinary people will just have to miss out. To quote Polly Toynbee from The Guardian, ‘In the US and UK the gap between the income of the top 10% and the bottom 10% multiplied by 14 times in the last 25 years.’ She should have added that growth rates have been disappointing throughout that period, half of what they were when the rich paid high rates of tax on incomes over £150,000. But the great blunderer does not do statistics and his dewy eyed view of laissez faire indicates he is also averse to modern history. He has been lucky. He suits this modern age of madness. When the going gets tough the tough get going is the famous phrase. Well, when these challenges involve the really nasty I usually sidestep them. Thatcher was ducked and Cameron was compared to Parker. This challenge is one of the least pleasant. 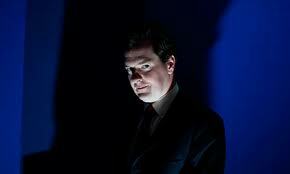 Elvis has his faults but George Oliver Osborne operates at his own chilling level. But an Elvis doppleganger does exist for our chancellor. Bienstock was not interested in quality, only in placing songs that earned him, Parker and others decent royalties. They were the musical equivalents of supply side economists. The impact on the demand from the public did not interest them. Osborne has the same feelings about the UK economy. If Bienstock squeezed from Elvis’ music the affection Elvis had earned from his fans then Osborne is more than willing to sacrifice economic purchasing power. Make the rich even richer and they will invest and the economy will grow is his one dimensional belief. Worrying about how customers will buy what is produced and having compassion for the unemployed is for economic softies. 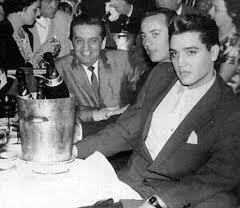 Bienstock had the same hard heartedness towards the talent of Elvis and to his fans being served tripe. Presumably, this was part of his ego. He wanted others to realise he could be brutal and competitive within the Elvis environment. It is easy to imagine Osborne doing the same with awful economic projections and the embarrassing comparisons with the positive effects of the Obama stimulus in the States. We picture him toughing out the horror with a smirk and a raised eyebrow, his wilfulness making him supreme to the too many competitive males that exist in the coalition. Special circumstances need to apply for men and women to take pride in failure but they often exist as many of us know from our workplaces. Perverse ambitions from unqualified men with huge egos applied in the career of Elvis Presley and they apply in the economic policies of the coalition government. Bienstock employed crazy accountants who were unable to understand long term consequences. Osborne is luckier. He has the Treasury and their myopic madness. All of this takes us back to why Osborne is hated so much and why Bienstock was willing to do such damage. Neither men cared about what they should have nor understood that they had responsibilities. Bienstock did not suffer and neither probably will Osborne. The rest of us are not so lucky. To read more about Elvis and his music, click here. Wow, this is a truly excellent piece which echoes my own thoughts and views most comprehensively. I could feel my anger towards him and the rest of his cronies, rising as I read. What a horror show, even vampires could be as evil! Gideon is surely carving out a legacy as one of the most hateable characters ever in UK politics. He is off to a good start as he has the face for it!